On Thursday, Sept. 13, our stores on Green Bay’s northside, as well as locations in Baraboo, Janesville, Madison, Portage and Tomah, will host Food for Neighbors Drive. We’re all about giving back to the community here at Festival Foods. Giving back is a part our company’s core values, that’s how important it is to our culture. That’s why, in 2004, we started our Food for Neighbors program in eight of our store locations. And why we’re so excited to partner with our friends at NBC26, and Y100 to sponsor the Food for Neighbors Drive at our store on Green Bay’s north side from 5 a.m. to 10:30 p.m. Thursday, Sept. 13. Some of our friends from NBC26 and Y100 will be on hand throughout the day of the event! Also that day, we’ll be hosting the Go Orange for Hunger (Food for Neighbors) Food Drive from 1-7 p.m. at our stores in Baraboo, Janesville, Madison, Portage and Tomah. Items donated in those stores that day will go to all the area pantries that partner with Second Harvest. 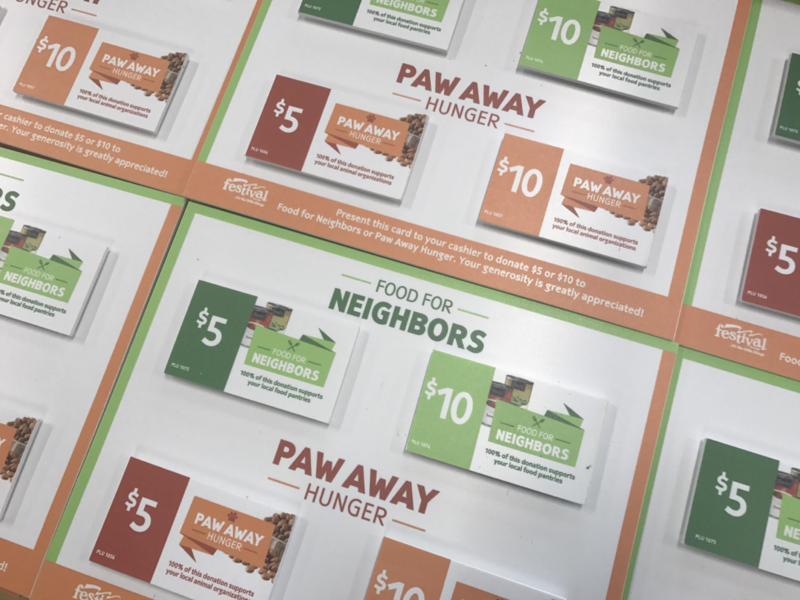 Our Food for Neighbors program provides guests with an opportunity to support local food pantries by simply adding a donation to their grocery totals. One hundred percent of all donations stay in the communities where they were collected. Don’t have items to donate at home? Add items to your grocery cart and drop them off on your way to your car – it’s as simple as that. You can also donate through our Food for Neighbors programs at a checkout. This event will benefit Paul‘s Pantry in Green Bay.